A green lawn is beautiful through winter, but it is worth the risk to your warm season lawn? If you plan on overseeding your lawn to keep it green through winter, now is the time to do so. But, just because it’s time to overseed, does that mean you should overseed? This is the very question so many of our customers ask us come October. There are certain pros and cons of having a lush green lawn all winter long. Yet, there are real risks to the health of your warm season lawn from overseeding, not to mention the question of resources and time. Before you make a decision, there is much to consider in regards to your current lawn. TIME SAVER: If you currently grow a St. Augustine grass lawn, don’t want to water through the winter months, or don’t want to mow through winter, then stop reading now and read this post instead! Are you still considering overseeding your lawn? Here are a few more things to think about. The type of lawn you grow matters. Con: If your lawn is St. Augustine grass, then we highly recommend you don’t overseed. 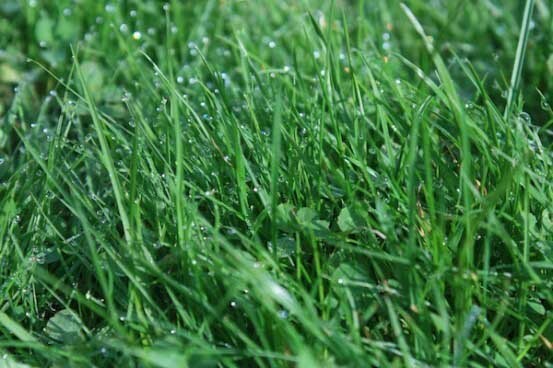 St. Augustine grass grows in such a way that good seed contact with the soil can be difficult without scalping the lawn first – and that damages the crown of St. Augustingrass plants. 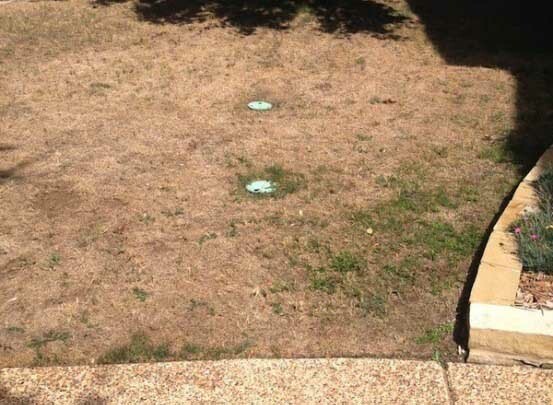 Since you’ll need to continue watering regularly through winter, Brown Patch could also be an issue as overwatered St. Augustine lawns are very susceptible. In general, we never recommend overseeding any lawn that is not currently healthy and vigorous. Pro: If your lawn is Bermudagrass, and it’s healthy and thriving, then overseeding could be an ok option. Just be prepared to water and mow all winter, along with other general lawn maintenance. However, even with Bermudagrass, we recommend that you skip a year every so often to give your warm season lawn a chance to fully recover from all that competition. This Bermudagrass lawn was overseeded too heavily for too many years consecutively. Learn more here. How much water are you willing to give up? This one is pretty much only a Con: For seeds to germinate properly, you’ll need to water three to six times daily at anywhere from 30 seconds to one minute at a time until germination occurs. Once seeds germinate, you’ll need to water regularly one to two times daily for seven days will keep the newly germinated seedlings from drying out. Then, cut back after about a week to just three times each week over a two week period per watering. Once your seed is established, once a week should suffice. But that’s still a lot more water than you’d use on a winter-dormant lawn. Also keep in mind that your local watering restrictions may not allow you to overseed. Pro or con…you choose: This all depends on how attached you are to your riding lawn mower (you know who you are). If you overseed you will have to mow the lawn weekly all the way through winter if you decide to overseed. If the weather remains cool, 50 F or lower, you might only need to mow every two weeks. But, with warm spells common throughout our winters months, you may have to keep up a regular schedule. BARE SPOTS: If you have bare spots in your yard that need temporary coverage to prevent soil erosion, weed invasions, or to cut back on muddy feet through winter, then overseeding can be a good solution for such areas. Whether you decide to overseed this month or not, the health of your soil will play a big role in weather your cool or warm season lawn grows vigorous and strong. Adding soil builders such as liquid compost extract (LCE) and other amendments to the soil will improve bioactivity and beneficial microbes in the soil. If you’d like help this season improving the health of your soil and lawn, take a look at our Soil Building program then give us a call for a free estimate.